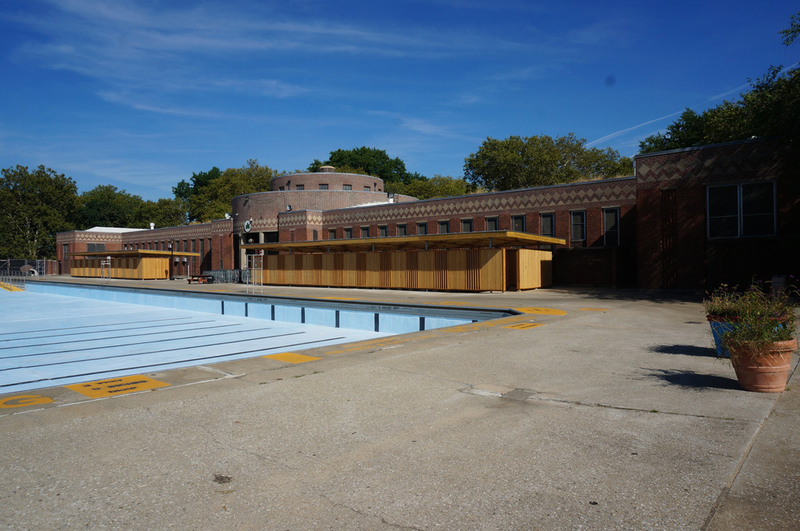 As part of a multi-year collaboration with the New York City Parks Department, Parsons Design Workshop students designed and built a locker room and changing pavilion for the Sunset Park Recreation Center, which will open to the public for the summer soon. These facilities free up much needed space within the Center. Construction on the project began in 2014 under the supervision of Parsons faculty member Joel Stoehr and Design Workshop Program Director Alfred Zollinger, and the Center is now open to the public. The Center was originally built in 1936 as part of the Works Progress Administration and received Landmark status in 2007, but had not been updated in some time. The Design Workshop additions to the Center have been featured in Curbed and e-Oculus. Full documentation of the project, and all previous Design Workshop collaborations, can be found here. The time lapse video below, created by Parsons student Mochi Liu, documents the construction of the Sunset Park Recreation Center lockers and pavilion. Construction Timelapse Raw Footage from Mochi Liu on Vimeo.